We’ve all had headaches. Whether they come from banging it on that open cabinet in the kitchen, as a result of infected sinuses, an allergic reaction, or brought on by the common cold, there are a ton of reasons why we get headaches. But, honestly, when you have one after a long stressful day, do you care why that dull pain is filling your head and your neck is aching or do you just want to know how to fix it? That said, if your choices of pain relief were between natural sources or fabricated chemicals, which would you choose? If you thought, “Well, [insert brand name here] works when I get a headache, then you aren’t alone. Many people rely on over the counter (OTC) remedies when dealing with head pain. Still, essential oils are a great way to get some fast relief when you are waiting for those meds to make it into your bloodstream. If you are asking yourself, “What essential oils are good for headaches?” then stick with us. 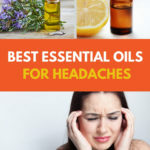 First, we will take a closer look at the menace and then give you a list of the best essential oils for headaches and migraines. What Are The Benefits Of Treating Headaches with Essential Oils?